I’ve been knitting a lot, lately, in and around other things. I don’t knit in the warmer months as I find my hands just get too sweaty, but cold winter evenings are perfect for clicking together needles (I like bamboo) and wool. This winter, I’ve discovered the joys of felting or fulling wool and have been trying different types of wools, just for kicks. 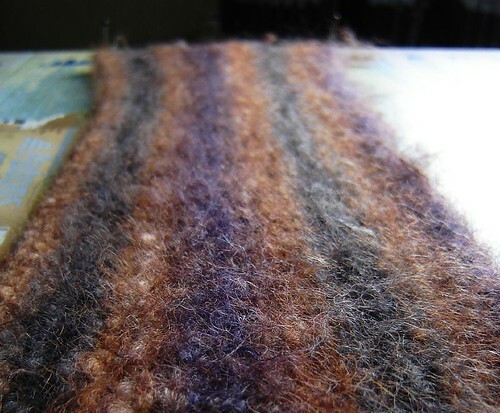 This is a 70% wool, 30% soy silk mixture, which is beautifully soft to handle and felts rather nicely. Warning note: make sure you felt wools inside some sort of bag (i.e. a pillowcase) when using the washing machine. 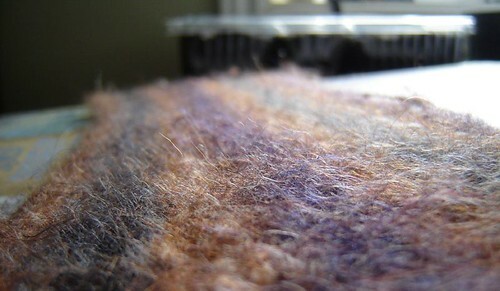 Felting sheds fibres and the soy-wool mixture sheds more than most! Gorgeous! The fabric looks very firm and very fuzzy. I found this same yarn recently and have knitted it, but not for felting. Did you find that it shrunk quite a bit? It’s quite firm, but amazingly pliant. I’m rather impressed. I think it’d make excellent slippers (http://www.fibertrends.com/viewer/patterns/AC67X.htm) or clogs (http://www.fibertrends.com/viewer/patterns/AC33x.html). Katherine wants a scarf (she’s becoming a real scarft fiend) and a purse. It shrunk about 20%, from my estimate. Not nearly as much distortion as the Lion Brand I’ve felted, but that could be because it was a smaller swatch than the Lion. No sweat! Incidentally, for those reading here and not there, I posted a comment on Amy’s blog pointing to Sarai’s scarf, also knit with the Soy Wool Stripes yarn. 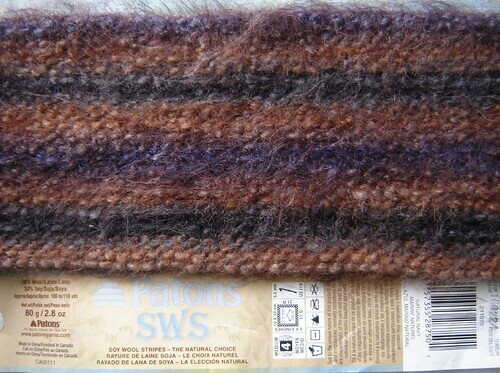 I see this is a Paton’s yarn………where did you find it? I’ve actually seen it in two places around here; Wool-Trends (a small local wool store packed with more wool and good advice than a hill in rural Scotland) and Michaels (a gangantuan craft supply store in which customer service and knowledgeable staff are not the aim of the ownership).